Anti-Fascist Action's guide to interactions with the police. From Fighting Talk issue 4, 1992/3. Anti-Fascist Action has one function only and that is to provide a vehicle for a principled working class opposition to the far right, an opposition that manifests itself politically and physically. This simple statement has the effect of lining up a whole spectrum of opponents to us on all levels, from our chosen quarry on the radical right to the toy-town revolutionaries of the left and now increasingly the forces of the state. The former two it is relatively simple to sum up an appropriate response to. One you introduce to the reality of the NHS in the 1990s, the other you just dismiss with mocking laughter. Which way round that response is supposed to be escapes me at times. However, it is the response of the state to militant anti-fascism that is addressed in this article. The state must be considered separately for a number of reasons, not least of which is the resources it has at its disposal, in terms of manpower, finance, intelligence (we are not necessarily talking about cerebral intelligence here), and its recognition that the non-sectarian basis of our class struggle will ultimately lead us into a protracted dispute with itself. All anti-fascist activists should be prepared for the inevitability of interaction with the paid agents of the state, the police. That interaction may be the seemingly innocent inquiry about the nature of a low profile activity such as the leafletting of an estate, to the arrest of a person in the vicinity of a vigorous demonstration. We should all be under no illusions whatsoever about these interactions. They are designed to remove our liberty from us. This is a very real threat and should be treated with the utmost seriousness. On any AFA activity, whatever it is, someone or some group of people should be assigned to deal with inquiries from persons outside the group. These inquiries could come from any number of sources - from people in the street, shopkeepers, press, or from the police and/or their agents. All inquiries should be treated the same. Far be it for me to suggest that the police would masquerade as members of the public or reporters to attempt to gain information, but others have suggested the possibility -so always assume that is what is happening. The response should be that you do not know what is happening, you are not aware of any leaders, you do not know who they should talk to. Plain ignorance is not a crime and you will not incriminate yourself or anyone else by exhibiting it. Hopefully, one of those appointed to liaise will step in if it seems necessary. Innocent inquiries will obviously be dealt with considerately, state inquiries will be stonewalled. Whoever is involved should avoid speaking to the police without another AFA person being with them. This is of paramount importance for two reasons. Firstly, it provides a witness if words or meanings are misconstrued or misinterpreted. Secondly, it reassures other AFA people that nothing untoward or damaging is being communicated. These are simple and easy guidelines that should be employed in all instances where AFA people are gathered together, whether we be having a social drink together or innocently caught up in a passing riot. In all other circumstances the individual should avoid talking to the police. Where it becomes unavoidable forget about obtaining your statutory rights, the police have already forgot about giving them to you. All the middle class nonsense about “they have to do this, say that and behave in a particular way” is a theory propounded and set in law by those who never come into conflict with the law because it acts in their interests. On the streets the practice will be the police will demand to know your name, where you live, where you have come from and where you are going to. Give them a name and address, and answer the other questions. Maybe you have just come from your home address and are out for a walk and are returning to that address. Do not answer questions about the names, addresses, or intentions of others. Most anti-fascists are understandably cautious about volunteering information about themselves so it is highly likely that you only know people by sight and very little else about them. Remember, every piece of information you give the state that you are not obliged to is of use to the state, it gives them names, provides a contact network, it places people at events. It may seem insignificant now but at a future date it may be used in a prosecution, for example to prove that a certain group are often together on demonstrations. Unfortunately, you may be arrested. Undoubtedly you will be innocent. The police will assume you are guilty and will attempt to prove that you are. If they do not have that proof, they may fabricate it. Any proof or information they already have, you can do nothing about. Do not attempt to explain it away either on the street, on the way to the police station or at the police station. You cannot make it disappear, you can only add to it. At the station the police will interrogate you. They call it interviewing. Insist that a solicitor is present, it is your right. The police are highly trained in interviewing people. Every question has a purpose. They will see through inconsistencies. If you lie once they will constantly refer back to that lie. You will not be able to outwit the intensive training and the years of experience that they have. This is particularly so because you will naturally be feeling under pressure and your story-telling abilities may not be razor sharp. Whatever you say, say nothing. The only reason police interview suspects is to gain enough evidence or get a confession in order to get a conviction in court. The majority of convictions arise because the police are given information by people under interrogation. This is why they are constantly demanding a change in the law to remove the right to silence. A statistic often bandied around is that 68 per cent of criminal convictions arise from confessions to the police - do not help them to convict you. 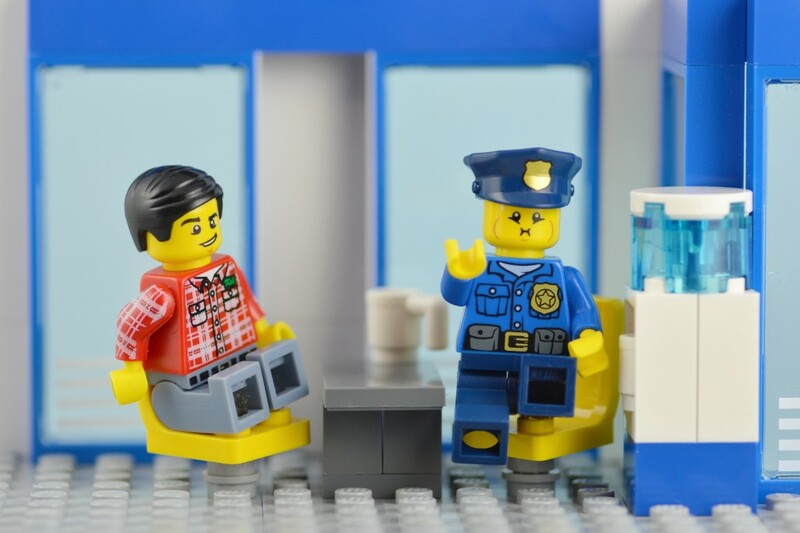 You only need give your name and address when under interrogation at the police station. To get bail you should also give your date of birth. The address will be checked to ensure you live or are staying there. After you have given this tricky information the rest of the interview will be simple. The answer to every other question is "no comment". No matter how innocuous the question the answer is "no comment". Always. The police may use any number of tactics to gain your confidence. Camaraderie, sympathy for your predicament, empathy for your cause, they may attempt to identify with your football team etc if they can find out what it is. Do not enter into conversation with them. If you do give them clues to your speech patterns, you may inadvertently give them information, you will find it more difficult to return to the tactic of responding "no comment" when the conversation returns to the matter in hand. Being arrested is very intimidating. The whole process is designed to strip you of individuality to soften you up for interrogation and onto the conveyor belt which ends in conviction and either a fine or imprisonment. Adopt a demeanour which indicates that you are not under any pressure. In the cell lie down and try to sleep. Do not discuss AFA or your case with anyone else in the cell. The cell may be bugged, your cellmate may be a tout or an informer. Tactics to alternately intimidate and reassure you may be used. The good cop/bad cop routine is widespread. They will leave huge gaps in the interview in the full knowledge that most people are intimidated by silence and will want to say something to remove the quietness. Use the time to relax. Do not say anything, do not acknowledge the silence. When the police deal with you they may use the threat of violence to elicit statements. Do not be scared into making statements. It is probable that you will not encounter violence. If you are hit it is unlikely to be any worse that the worst beating that you got at school or in a pub or on the street. It will last a finite time measured in minutes. Prison sentences are measured in months and years. Do not sacrifice years of your life or your comrades' lives to avoid several minutes pain and a few cracked ribs. The answer to every question is "no comment". The police may intimate to you that you will be bailed as soon as they clear up a few points and if you assist them then your release will be quicker. Your solicitor may collude with this. Exactly the opposite is true. If you refuse to answer questions then they have no basis to continue interviewing you. They have no additional information to investigate or corroborate. The less information they have regarding you the sooner you will be through the process and the sooner you will be back on the streets. If you are not bailed it is because you were never getting bail not because you refuse to answer questions. Do not be influenced by these type of promises nor by the solicitor's desire to return to the dinner party or game of bridge. You have the right to a solicitor. Exercise that right. The preference is to get one recommended by AFA if this has been arranged for the particular event you were lifted from. Failing that you may yourself know or prefer your own one. If these options fail use the duty solicitor. The important thing to keep in mind when dealing with solicitors is that they are not on your side, they are there to represent you. Most will do this in a way that does not do them any harm. If your solicitor advises you to make a statement the only statement you should make is to tell him/her to piss off. They are there to be aware of your rights and to advise you of them. To insist you are bailed. To ensure you are rested, exercised, and fed at the set times. It is not unheard of for a solicitor to inform the police of "confidential" statements that you may make to them which may indicate your involvement in a transgression of the law. Even if you are confident that your solicitor is above reproach it has recently been ruled lawful for the police to bug cells or conference rooms in police stations to gather information from solicitor/client conversations. When a solicitor arrives to represent you do not abdicate all responsibility to them on the basis that they are experts in the law and you are not. Be aware of everything that is going on - do not lose interest, even if it seems incredibly tedious. Although you may be on legal aid you are employing the solicitor, ensure that they act to your instructions in your best interests. The probability is that the person attending the police station is not a solicitor at all. They may be trainees, or clerks with little or no experience. Your legal representative may never have attended a police station before to represent a client. He/she may never have spoken to a police officer before. There is a wealth of practical experience in AFA which should not be surrendered to a neat haircut in an impressive suit carrying a law book and a file with your name on it bound in pink ribbon. You must stay in control. If you do not it is you who could pay the penalty not a middle class prosecutor not a middle class defence solicitor, not the police, not the judge in the court. All these people potentially interact in pubs, restaurants, clubs, lodges. They share class interests which exclude us. It is not in their interests to be involved in conflict with each other. They may well have very cosy supportive relationships which they will be loathe to endanger for a working class anti-fascist activist - you must be in control. Do not engage in political conversations with the police. If you do you provide them with information about your political affiliations and those of your comrades. They may be able to determine whether you are a "political animal" or a "brutal thug". You have nothing to gain from such a conversation. You will not win the debate, and even if you did we will not recruit police officers into AFA. So you will have wasted your time, your time is more profitably spent in your cell asleep on your bunk. Do not volunteer for any police procedures (e.g. fingerprinting, photos, identity parades, forensic examinations). When charged the police will fingerprint and photograph you. If you resist fingerprinting they will use force, you can continuously smudge the imprint but they will become steadily more insistent and eventually it will become too painful to resist. Photographs can be similarly painful. Avoid unnecessary pain. Do not wear glasses if you normally do so, attempt to rearrange your hair. If you are a happy person, frown. If you are a miserable old git, attempt to smile - this may need practice at home first. Do anything to try to make the photo different from you. Once taken it is always there to be used to identify you in the future. It seems incredibly unlikely that they really destroy such items when you are released without charge or found not guilty. Identity parades should be avoided at all costs. You are totally divorced from any control at all. The witness may have been tipped off about your presence, you may be the only one with the salient feature. You cannot, normally, be forced onto a parade. A possible tactic if you are is to immediately invalidate it, possibly by asking if it is too late to change position as the witness is brought in. Do not volunteer your clothing, skin, hair, etc for forensic examination. Blood is notoriously difficult to clean from skin and clothes. If it could have been there, assume it still is. If you are confronted with forensic "evidence" do not succumb to shock and confess all. It may not be conclusive, it may not even be true. After all, you are completely innocent. When you are brought into the police station for questioning your property will be taken from you and held until your release. You will be asked to sign for it to remove the possibility of theft or loss by the police. Be very careful when signing for property. It is not unknown for additional items such as bloodstained coshes to be included in this list. Insist that they be listed and stored separately and do not sign for them. If they refuse to remove the disputed item do not sign for anything - it is better to lose the Cartier watch than to admit to being in possession of a broken beer glass and three ounces of fascist face. Eventually you will be released on bail or without charge. Bail may be of two types. You may be bailed to appear in court to answer specific charges or you may be released on police bail while they investigate the matter further. Regardless of any outcome you should contact AFA immediately upon release. For our demonstrations we will be coordinating the collection of witness statements, press comment, photographs, etc. We need to debrief you to assist you with you defence if you are charged. Regardless of that, it is desirable to maintain information about police behaviour and lines of questioning in connection with anti-fascist activities. You have nothing to gain from a political conversation with the police. You will not win the debate, and even if you did we will not recruit police officers into AFA. So you will have wasted your time, your time is more profitably spent in your cell asleep on your bunk. The Indian Rico strike and the aftermath: when capital wants to "de-risk"